“It was an absolute act of target practice, effectively, because the cheering from the soldier’s fellow soldiers basically was just completely inhumane and outrageous,” writer and academic Kamel Hawwash of the Palestine Solidarity Campaign told RT. Tamer Abu Daqqa says he is the victim in footage that emerged earlier this month, which shows an Israeli sniper shoot a man to the sounds of cheers. “I did nothing. I was just at a demonstration. I went with my friends to help them and before I reached the place, they shot me. The soldier knew I was going to help them, and that’s why I was shot,” he said, according to footage by Ruptly news agency. He was shot in the leg and required treatment in the hospital. He said he has been struggling ever since the incident occurred on December 22. Although the IDF has launched an investigation into the incident, the sniper that fired the shot has been cleared in an initial review. However, the military said that those who cheered and filmed the incident will face a disciplinary hearing. “Unapproved filming of an operational incident, distribution of material, and the expressions heard in it… is not the spirit and the level of restraint expected from IDF soldiers and it will be handled appropriately,” the military said in a statement. It comes as protests continue at the Gaza border as part of the Great Return March. 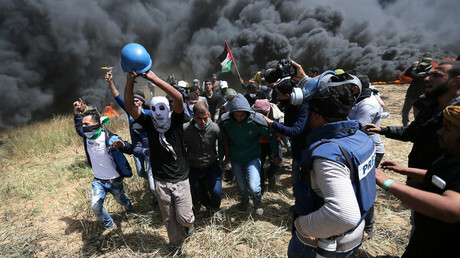 The demonstrations, which have been taking place since the end of March, are slated to continue until Nakba on May 15 – a day when Palestinians mark what they regard as a mass execution from their land as a result of Israel’s establishment. At least 34 Palestinians have been killed along the border since the protests began on March 30, according to Gaza Health Ministry figures cited by The Times of Israel.